LOCATION.--Lat 41°08'28", long 74°06'58" referenced to North American Datum of 1983, Ramapo Township, Rockland County, NY, Hydrologic Unit 02030103, on left bank 13 ft upstream from bridge on U.S. Route 202, 2.5 mi northeast of Suffern, and 4.8 mi upstream from mouth. PERIOD OF RECORD.--Continuous-record discharge station, water years 1959-95, 2006 to current year. Annual maximum gage, water years 1996 to 2005. REVISED RECORDS.--WDR NY-79-1:1977(P). WDR NY-87-1:1986. WRD US-2011: 2001(M), 2005(M), 2006(M), 2007(M), 2008(M), 2010(M). GAGE.--Water-stage recorder with telemetry. Datum of gage is 321.57 ft above NGVD of 1929. 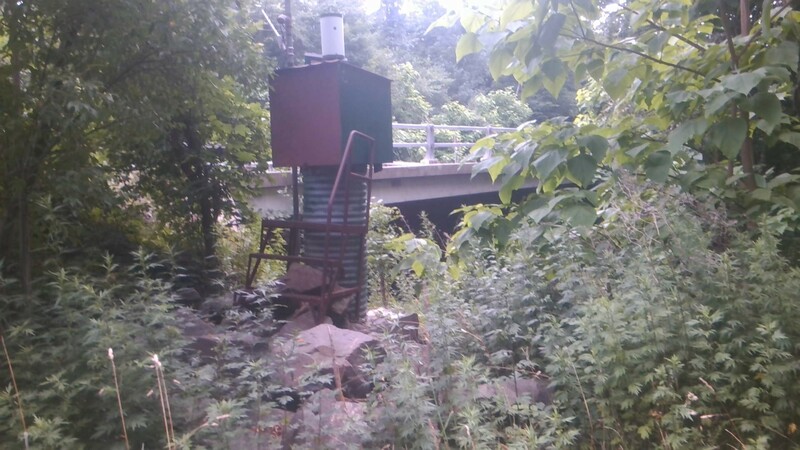 Prior to Nov 18, 1976, water-stage recorder at site on right bank, 13 ft downstream, at present datum. REMARKS.--Records fair, except for estimated discharges, which are poor. Occasional regulation at low flow due to unknown source. Pumping from wells upstream of gage may affect flow past gage. Discharges above 2,200 ft3/s from rating curve extension on basis of contracted-opening and flow-over-road computations. EXTREMES FOR PERIOD OF RECORD.--Maximum discharge, 3,700 ft3/s, Aug 28, 2011, gage height, 10.66 ft, from rating curve extended above 2,200 ft3/s on basis of contracted-opening and flow-over-road computations; minimum discharge, 0.05 ft3/s, Oct 20, 1970, result of temporary pumping from gage pool. National Weather Service flood stage for this gage is 4.0 ft. Rain gage data is available from this location at this link.